CLEMSON 83, Southern Illinois (Salukis, 15,137 students, Carbondale, IL) 75 -- Tanner Smith scored a career-high 26 points and freshman Rod Hall converted a three-point play with 3.8 seconds left in the second half to send Friday's second-round game in the Diamond Head Classic into overtime, where the Tigers eventually claimed a over Southern Illinois. The win improved Clemson to 7-5 on the season, and dropped the Salukis to 3-7 overall. In the overtime period, the Tigers made only three shots, but converted 15-of-17 at the charity stripe for a 21-point outburst. It was Clemson's second overtime win under Brad Brownell, and the second straight year the Tigers triumphed in extra time in a regular season tournament. 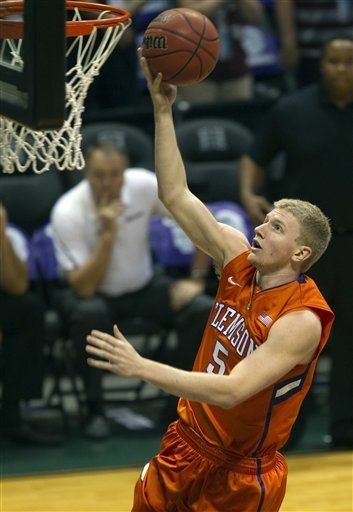 In November of 2010, Clemson beat Seton Hall in the final round of the Paradise Jam in the Virgin Islands. Smith scored 24 of his 26 points in the second half or overtime. The senior from Alpharetta, GA was 8-for-16 from the field, including 2-of-5 from three and 8-of-9 from the free throw line. His 26-point effort was an individual scoring high by a Tiger under second-year Head Coach Brad Brownell. Hall added a career-high 18 points on 5-of-10 shooting and 7-of-9 free throws. Devin Booker matched his career and season-best with 16, as he hit 7-of-9 from the floor and 2-of-3 at the line. A fourth hero in the game was recent graduate Bryan Narcisse, who scored seven points but delivered a career-best 12 rebounds in 31 minutes of action. MARYLAND 65, Radford (Highlanders, 8,878 students, Radford, VA) 60 -- Ashton Pankey scored a career-high 17 points to lead three players in double figures as Maryland held off upset-minded Radford Friday night. Pankey made 6 of 8 from the field, including a free throw followed by back-to-back dunks as Maryland broke a 45-all tie to take the lead for good with just over 10 minutes to play. With a 13-6 run, Maryland took a 58-51 with 3:24 left. Terrell Stoglin, the leading scorer in the ACC, made just 5 of 18 from the floor and failed to score over the game's first 18 minutes. He finished with 16 points, however, and his three free throws in the final 32 seconds helped ice the game. James Padgett added 10 points and a team-high nine rebounds for Maryland (7-3) which posted a season-low seven turnovers.